101 Pre-School Projects – Free Download! It’s warm, it’s cold, it’s windy, it’s raining, it’s cloudy…yes indeed: It’s March. I’ve had fun this week pulling out some project ideas that have been buried throughout my website. Did you make some Homemade Bubble Bath? That’s a super simple idea your kids can have fun making with you. In an effort to shed some sunshine upon all of us struggling with a touch of spring fever, I opened up a freebie I had put together a few years ago, tweaked a few things, and redesigned the cover to make it available to you again. If you and your kids are going stir-crazy, I believe you’ll find an activity or twelve to do together in this free eBook. Yep, there are over 100 ideas, recipes, games, and activities for you to read through and pick from. Kids older than pre-school age are sure to have fun with these ideas too. These ideas came from moms and grandmothers – all Heavenly Homemaker Readers. All of you are so creative, which is what makes this eBook so much fun! You’ll be able to use this eBook year round, as it has fun ideas for outdoors too. Help yourself to this fun, free eBook. Spread the word to your friends so that they can come get their free eBook too! Together, we will survive this crazy weather! 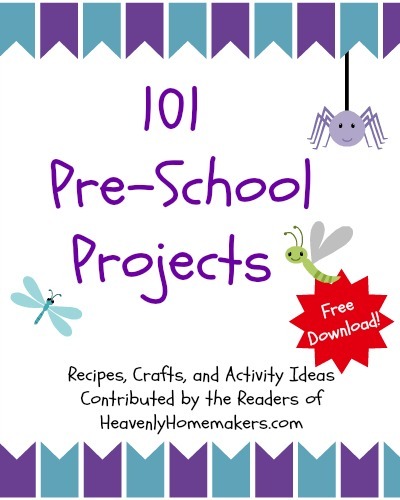 Grab this FREE 101 Pre-School Projects book here! I’m excited to share that signing up for these freebies will connect you to our new Heavenly Homemaker’s Learning Zone. It’s free, of course. You can unsubscribe at any time, your info will never be shared or sold, and being on this list means that you’ll be the first to know of the other fun (yes, FUN!) educational tools we’re putting together! Thank you so much! I just downloaded the book and printed it out. I’m looking forward to doing some of these projects. What a blessing!!! Thank you so much. I have a huge case of spring fever, and having some new ideas is a great distraction. My little love makin things with me, so you ha US at ‘homemade bubblegum’.